Negotiating my way out of the airport posed an unforeseen challenge. I could not see a sign that said “EXIT” or “outside world – this way” and when I approached a customer service desk there was absolutely nobody there. At a loss, I actually resorted to approaching a stranger who looked like they knew what they were doing. Once in the main terminal I found a shuttle service that had the Denver Tech area listed prominently as a destination – perfect. With door and platform number in hand, I headed out of the terrifying airport. Jumping from the kettle into the fire is what happened next. Quickly apparent was the error in choosing this particular shuttle company. When I first approached the platform I could see a driver cleaning his windows and wiping some bugs off the front of his van. Was this my shuttle? It looked very welcoming. No, no, no. Mine was filthy – covered in a week’s worth of grime and sounded like a bucket of bolts. My heart sank. I was tempted to go and get a refund, yet decided to chill out and see what was going to happen next. You never know, I might have a very pleasant experience regardless of the dilapidated state of the vehicle. Wrong. I’d already begun to think I’ve made a very, very big mistake in travelling to Denver. In the terminal there were signs informing people where to find the tornado shelters. TORNADO SHELTERS!!!! 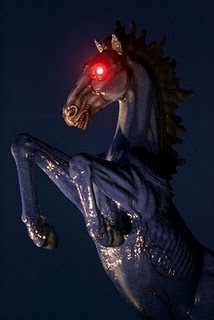 And upon leaving the air conditioned micro climate of the airport, I staggered out into the blast furnace that is Denver, and then, much to my alarm, we drove past a larger than life statue of a dark blue horse rearing up with glowing red eyes. What the hell?!!! What sort of people live here and what do they worship? The demon horse frightened the beejeepers out of me. I wished I could turn return home on the very next flight. Despite my churning stomach I sat calmly and watched the scenery go by. I must admit, it was actually rather beautiful. It reminded me a lot of driving along the highway approaching Merritt, the wide open views, sprawling buildings, dry, open grassy areas. As I tried to distract myself with the lovely scenery, my driver’s right foot seemed to rise and fall with no relation to the flow of traffic or distance between us and the vehicle ahead. Lurch forward, slip back a bit, lurch forward again, again, again. I think the vehicle in front of us must have thought that we were going to drive right over top of them. We lurched through the downtown core, lurched through “Orchard” and finally stopped at my hotel. Relief. This entry was posted in everyday musings, travelling and tagged blue horse, Denver, hotel, scenery, shuttle, tornado. Bookmark the permalink.